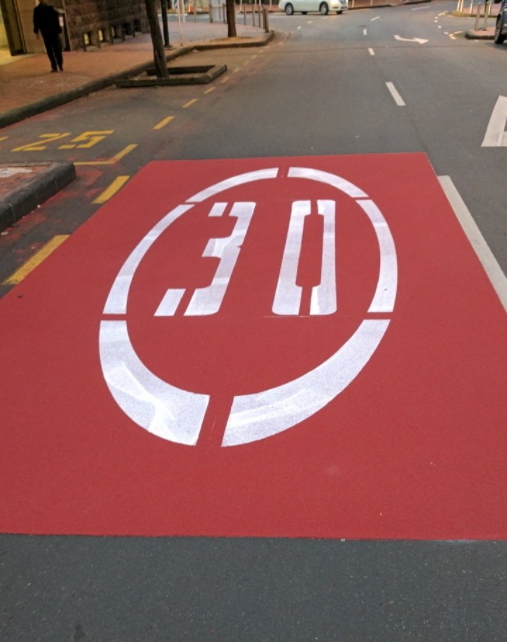 Some good news that following consultation earlier in the year, Auckland Transport have changing the speed limits at Wynyard Quarter to 30km/h permanently. 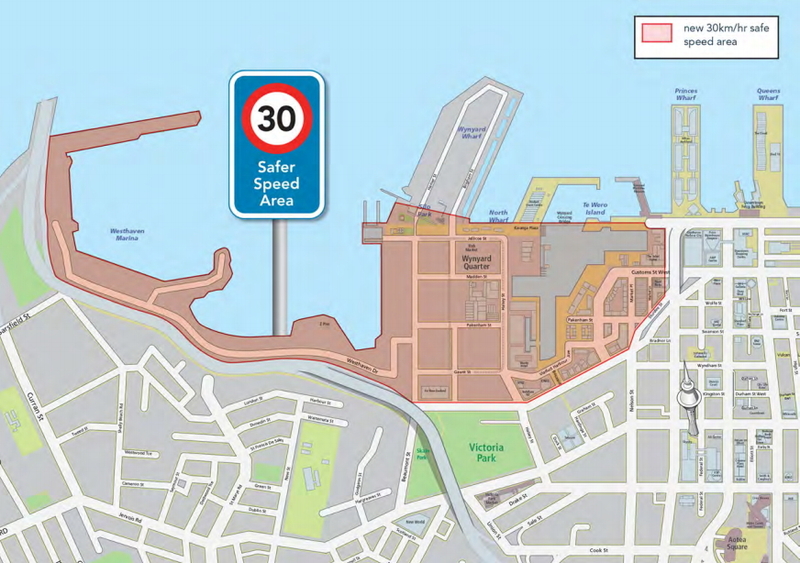 A permanent safer speed limit of 30km/h has begun in Wynyard Quarter and Viaduct Harbour. Much of the area has already been under a temporarily lower speed limit because of construction work being carried out. AT’s Manager for Walking, Cycling and Road Safety, Kathryn King, says, “It is the right of everyone, including children, the elderly and the disabled, to be able to get around their communities on foot and on a bike without risk. Underpinning any decision to alter speed limits is the basic awareness that people are vulnerable and they can make mistakes on the road. While crashes are inevitable, the severity of impact can be tempered by a number of factors, of which a reduction in speed is possibly the most critical for survival. “We are very encouraged by the consultation we undertook in the area that received very positive feedback from both people living and working in the Wynyard Quarter and Viaduct Harbour and also people just passing through to enjoy this beautiful part of the city. People support keeping each other safe and the reduction in speed, along with the continued education work being done by Auckland Transport and Panuku Development Auckland. Auckland Transport and the NZ Transport Agency have been working together on a new approach to speed management, to create safer and better environments for people walking, cycling and sharing the road space to keep everyone safe. All of the streets in the area will be reduced to 30km/h except Hamer Street and Brigham Street which will remain at 50km/h. AT’s longer term plan includes physical changes to these roads to make them more suitable for a lower speed limit and this will be reviewed in the next few years as the area continues to develop. Here is a map of the areas covered. It’s good to see this progressing, we need to do the same to many areas around Auckland, and of course through the rest of the city centre. Do we have any other examples of 30 km/h limits on central city streets? Or any that aren’t and should be? Victoria Street in Hamilton has been 30km/h for years. It’s excellent, has really made al fresco dining there more enjoyable than it was. What are the stats on the number of people hit by cars in the Wynyard Quarter area by cars doing 50kmph? To me it’s more about making people-friendly streets, isn’t it? I think in many instances, such as if a street is narrow, or has parks/schools/shops/hospitals on it, then the template speed limit should be 30km per hour. We don’t need to wait for anyone to be hit by a fast-moving vehicle when we can instead identify high-risk areas and take preventative steps. Incidentally this question was raised during the recent council elections, and support for targeted speed reductions was almost unanimous from candidates in my area. What is the reason, if any, to need to drive faster than 30 km/h in the Wynyard quarter? What are the stats, if any, on how people have taken to walking more in roads with lower speeds? Um, pretty good, I think. Check the conclusions section – seems fairly cut and dried. Thanks for raising the question! great as long as its enforced. Problem in Wellington is they are frequently ignored (tinakori rd shops im looking at you), some point to point cameras and a few fines would work. Yes, same problem with the 30Km/h zone at Ngaio shops. Good, but as long as it’s a step to getting rid of cars altogether from most of these streets. Absolutely incredible that cars can drive along Jellicoe St, right through the middle of a public space filled with restaurants, bars and kids play areas. This is clearly not the understanding of those that promote “solutions” like the $1.4bn Waterview motorway. I think that message is very slow to filter through the grey matter of such people. Can’t be long now before the Wynyard Tram is back in operation. I go I see cars parked on the grass berm, the footpaths, or facing the wrong direction. Will the Wynyard Quarter be any different ? Well said Grumpy. A law that is not properly enforced is not a law at all; merely a suggestion. I’m particularly thinking of cars parked on pavements. a few tickets (followed by howls of outrage it the herald) usually helps. In fairness I’ve found AT respond when I call them about cars on footpaths. They don’t have eyes and ears everywhere, they will always need some public assistance. How about allowing Auckland Transport to enforce lower speed limits (like 30 and 40 zones)? It seems like the police have better things to do. I promise you, you do not want another council controlled traffic department again, ever. They were a cash cow for amongst other councils, the Auckland City Council, and ran quite a profit specializing in THE most trivial of traffic offences. And there is a plethora of offences that every driver does wrong everyday, knowingly or not. They most especially targeted the lower socio economic aka poorer areas like Glen Innes and Avondale, easy money. They made the Gestapo look like social workers. Thankfully disbanded in the 80’s by the government of the day and forcefully merged into the MOT. The MOT’s later merger with the police on the other hand was not a good thing. If you are a believer in for profit motivated law enforcement then this is the baby for you! Thanks. And what was successful in the brief period between the Council Controlled Traffic Department and the merger between MoT and police that didn’t work before or after? The police absorbed the MOT in about 1992, I would argue to save the government money, and sadly ever since have watered down what was a necessary law enforcement service into a low priority nice to have. This was well predicted before John Banks, the then Police Minister forced the merger but then again Banks was never one to listen. Thanks. I hadn’t realised there were three stages. I just remember there used to be traffic cops but didn’t know the history. Cheers. Yes, the infamous ‘Final Solution for Speeders’ was really a black time in our history. Even the Auckland traffic cops in patrol cars used to wear jodhpurs and riding boots. The black uniforms just completed the picture. I hope one of the longer term outcomes/aims is that we start seeing spaces designed so that if there are vehicles allowed to use the space drivers would be compelled to drive slowly because of narrowness, obstacles and the clear understanding that this is a place for people, on foot, bicycle, mobility devices, PT, first and foremost. Not just because there is a sign outlining a limit. Yes, indeed AT’s refusal to make streets lower speed zones is because they won’t post speed limits unless the infrastructure is there to make the lower speed intuitive. Is that the case on Queen St? Apart from the signs on poles at the side of the road which are easy to miss in the visual clutter of the city the street looks pretty much like any other urban street. The big red painted area with 30 on it as shown above should be used wherever these limits are introduced as one persons intuitive is another persons totally oblivious. It would also make it more likely to be noticed and adhered to. Safer to make it clear than ping someone who hasn’t seen the sign. BTW these road markings do not appear in Queen st.
Mmm… I didn’t even know Queen St was 30 k until I read this post. But then I haven’t driven in Queen St for decades. I wouldn’t go there except by PT or bike. I wonder what their rationale is? Were measured speeds low enough anyway for other reasons that they felt the environment seemed like a low speed zone? Barnes-Dance crossings frequent enough (in time and space) that it feels right to go slower? Anyone know? +1, on streets in town centres where we expect traffic to go 30 we need gateway treatments beyond actually narrowing the carriageway or posting speed signs. A big patch of red asphalt, especially printed with the brick patterns and a big white 30 in a circle would work well. We need this in place like Mt Albert, Remuera, Mission Bay, Belmont, and Highbury, but also on Symonds Street from the Music school up to about 70 Symonds Street. That point is crucial to the overall success of the scheme – the decision on speed limits also needs to be made earlier in the process as they would help influence street designs. When the roading has not been designed for lower speeds, though, there is still quite a bit you can do to retrofit. The intersection repair movement is interesting in the US, where communities (which approval from the roading authorities) are allowed to paint and personalise intersections. It doesn’t actually take that much to get drivers to slow down and remember more vulnerable road users like children are about. I applaud the council for this wonderful new solution. More rules for conscious Kiwis to obey while Indian couriers and Chinese in Audis speed along at 60 in a pedestrian zone with not even a camera in sight. Aren’t we progressive? I think we are! As opposed to all the other couriers and Audi drivers…? So Indians and Chinese can’t be Kiwis? Oh dear….